Here’s an interesting little peripheral if you’re interested in getting more out of your Armored Core experience. Sony released its first Dual Analog Controller, officially known as the PlayStation Analog Joystick back in 1996, which look like a pair of flight sticks (or twin-sticks if you ever played Virtual-On). 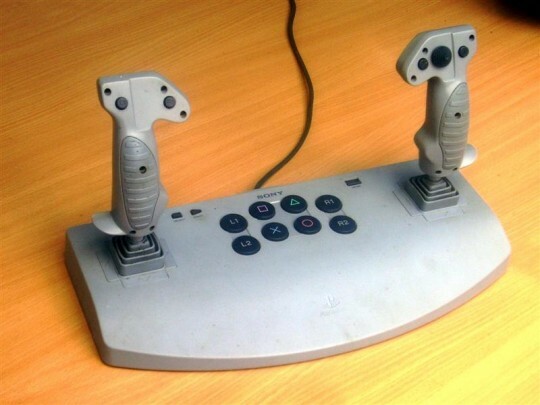 Unlike the overwhelming 40 button Steel Battalion controller for the Xbox, these twin-sticks are much more intuitive for mech gamers looking for a simulation fix. We’re very much hoping to play AC with our own sticks once modifications start. I think there are already plans of that happening, we just don't know when. Damn, these sticks are tough to use at first but pretty rewarding once you get used to them. So tough to use that i started calling one of them “the noobmaker”. I just got the T.Fl!ght Stick X and it works awesome for Armored Core 4.